The collecting of international numismatic items (coins, currency and exonumia) can be a fun and interesting hobby. Anyone with a desire to learn of the history of civilizations and countries can learn what was considered to be so important that their money proudly displayed it. Others wish to learn or teach finer details of unique coins. Education and the sharing of knowledge is a primary focus of NI, with the scholarly NI Bulletin, the library and the publications. In addition, the semi-annual Bid Sale allows members to acquire items of interest or to sell excess numismatic items. This is done in a spirit of friendship with members who have similar interests. 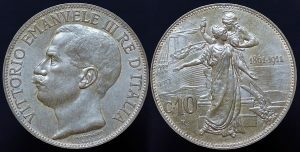 The 50th Anniversary of the Unification of Italy ("Cinquantenario" 1861 - 1911) fell during the reign of King Vittorio Emanuelle III. The Royal Mint of Rome celebrated with a particularly fine set of coins to commemorate the event. Beyond the typical kingly portrait by D. Trentacoste the reverse of this 10 Centesimi, and the other coins in this short series, were designed by the medalist Luigi Giorgi. The reverse design, done in Neo-Classical style, features two statuesque figures. The female represents a figure of 'Italia,' while the male figure behind, which may be an actual statue, is supposed to represent 'Rome.' To the right is a common theme of Italy, a plow, in this case draped with various agricultural produce. Behind, seemingly sailing into the scene, is a large wooden warship with is bow railing decoratively adorned. This design also appears on the 2 Lire silver coin in this commemorative series. For the very scarce 5 Lire silver piece and the scarce 50 Lire gold piece in the series, the ship sailing into the scene is replaced with a modern steam driven battleship, similarly adorned. Evaristo Luigi Giorgi, was a goldsmith, engraver, and medalist. He was the chief engraver of the Royal Mint in Rome and the first director-teacher of the School of Art of the Medal. Other coins by Giorgi are the rare pattern 1 dollar coin featuring Yuan Shi-Kai ("Fat Man Dollar") of China, and other Chinese coins, and at least one coin of Italian Somaliland. If you are not an Numismatics International member, and you wish to view a sample of the NI Bulletin, please visit the "NI Bulletin Sample" page on this website. The NI MAILBID-SPRING-2019 (907 lots) closed on April 15. The lots can still be viewed on this site. The NI Mailbid Fall 2019 will be available on September 1, 2019.